Do you have a large breed dog that tends to pull on a leash when walking? You might feel lots of stress when trying to keep your dog in check, but you certainly don’t want to put your dog at risk of harm. The good news is that you can find many quality leashes that are safe for your dog to wear. This guide will help you identify the best leash for big dogs that pull when walking. You’ll feel confident in how well you can keep your dog in check with one of these leashes. Why Do Dogs Pull When They Are On Their Leashes? The main reason why a dog will pull on a leash is that the dog wants to move in a specific direction regardless of whether or not you’re ready. Also, there are times when the environment might be more rewarding to that dog than the handler. The dog might see things in its environment that are unique or worth chasing after. How Do You Train Your Big Dog Not To Pull? The key to training your big dog to not pull is first to ensure that you have the right leash on hand. The leashes you will read about in this guide are all helpful choices. After that, you need to train your dog with shorter walks. Bring treats to reinforce your dog to avoid pulling the leash. Keep a tight hold on the leash as well. Don’t forget to keep the leash short in length so you will have more control over your dog. Wait for your dog to calm down before putting the leash on him or her. The dog will be more likely to obey you when that dog has calmed down after a bit. Watch the video below on how to train your dog not to pull while walking. What Are Some Tips On Leash Training Your Dog? Walk your dog each day so your dog will be used to the leash and how the pet is to be controlled. Train your dog to stay on command. The skill gives your dog enough of an ability to stay calm when walking. Walk close enough to your dog so you can notice a small bit of slack on the leash. Give your dog treats when the dog is by your side while walking. What To Look For In The Best Leash For Big Dogs That Pull? A harness leash fits around the upper section of the dog’s body. The design does not produce a tight feeling around the neck. You would have to add a separate leash to the back end of the harness, although the design should ensure that the dog will not be likely to feel any pulling sensations when walking. A head collar leash will link around the dog’s face. It will go near the base of the eyes and the back part of the mouth. Your dog’s mouth will not be impaired when wearing the leash, although this is provided you secure the leash correctly. A prong collar is designed to fit around the dog’s neck. The collar will apply pressure evenly and will not produce quick jerking motions if the dog does pull on it. The collar itself can also be adjusted by adding or removing links to prepare a firm fit. Nylon works for how well it can handle moisture and for coming in many colors. Leather is comfortable and feels soft on the dog’s skin. A leather material can last for years. Metal chain leashes are durable enough to last forever, but some chain leashes are hard to adjust. A metal leash may also weight a little more than others. The length should be analyzed between where you hold the leash and where it ends at your dog. Keep the leash long enough so you allow your dog a bit of freedom and control, but make sure the leash is easy to handle. The leash can be around four to ten feet in length on average. The locking mechanism on a dog’s leash can include a buckle, a small chain, or even a combination lock. Make sure the locking mechanism you use for your dog’s leash is safe for the dog to tolerate while being accessible on your end. You can adjust a dog’s leash through a buckle in most cases. Chain-based leashes typically require you to add and remove chain links, which makes the collar harder to adjust while on the go. The leash must be safe for the dog to handle. The design includes a layout where the feature that helps with removing the collar will be difficult for the dog to access with one’s mouth or leg. Also, the collar should have a locking setup that ensures that the dog will not be choked or squeezed by the collar. The collar should also have a reflective finish. Light can shine well on the collar to ensure the dog will be easy for people to see in any condition. The body of the leash should be sturdy enough to where it will not tear apart even when the dog tries to chew on it. Metal collars are impossible to chew through, but leather and nylon materials may wear out. Look at how thick or sturdy a leash is so you can find something that your dog will not try and chew through. Your first choice for a safe dog leash is this model from the makers of the ThunderShirt for dogs. The ThunderLeash provides a gentle surface that fits well around your dog.The leash can be attached to your dogs’ collar just like any other leash. When your dog is a little agitated or nervous, you can wrap the leash around the dog’s body and then slide it into a harness spot. As the dog pulls, a light amount of pressure is applied. The dog will stop pulling at this point. The calming sensation keeps the dog from feeling agitated and likely to pull on the leash. The buckle on the leash provides a good fit for your dog to handle. The material on the leash will not slip off or slide along your dog’s body, thus ensuring a consistent position all around. The connection at the end provides a comfortable body that links well to most types of collars. The leash is good for dogs 25 pounds or heavier, thus making it useful for your larger dog. The nylon body of this SparklyPets rope makes it one of the most outstanding models for your use. The nylon material is a chew-resistant surface that does well for large dogs who might try to chew through other types of leashes. 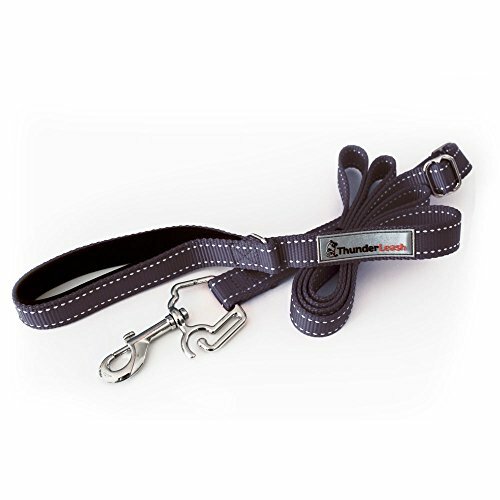 The metallic hooks on the base of the leash provide you with help for linking the leash to a collar in moments. Leather joints are included to create a firm series of connections. All of these features are paired with secure stitching materials that will not come apart. 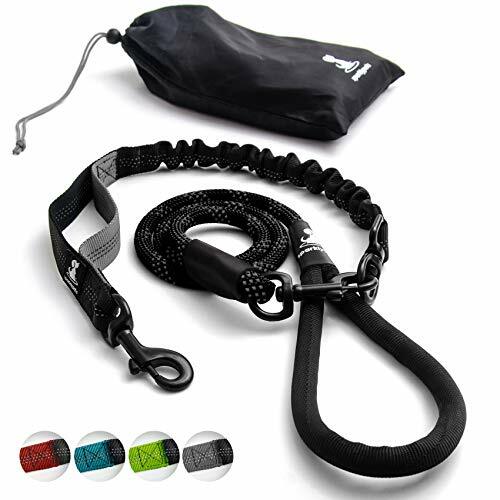 An elastic bungee attachment is included with the leash. The bungee absorbs any pulling motions that your dog might produce. This ensures that you’ll have more control over the dog while walking. You can add the bungee attachment to the end in moments. You can remove it to create a four-foot leash that gives you more control over the dog. The bungee feature doubles the length of the leash to allow for a little more room for the dog to walk with. 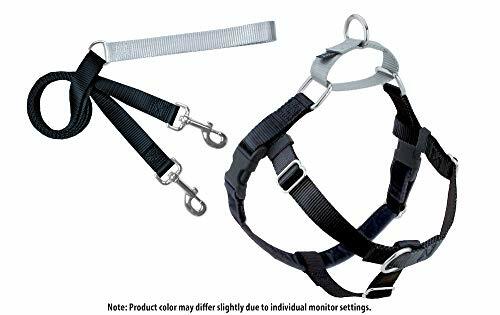 Your third option for the best leash for big dogs that pull is this no pull dog harness model from PoyPet. The design uses two metal leash attachment points. 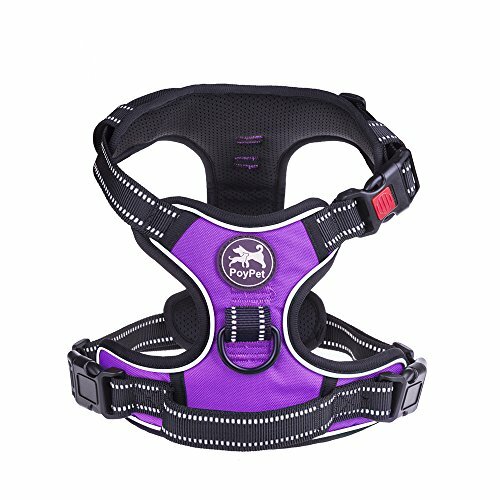 The harness fits well on the dog’s body and includes a bright reflective body. The quick-snap buckle on the neckline makes it easy for you to add and remove the harness on the dog’s body. The belly straps feature elastic materials that stretch well and can absorb jerks. A small pocket is also included for when you need to tuck in the belly straps. The handle on the base of the harness features a soft neoprene material. The surface works well for training intentions. The design is easy to put on and take off. You don’t have to slide this over the dog’s head for the unit to fit. 2 Hounds added both a dog harness and a leash in this model. The harness fits well over your dog’s chest in moments. The included leash secures to the back part. Metal clamps are included on the leash to keep the body linked to harness. The large body of the leash and harness makes it easy for the unit to fit on a large breed’s body. The fitting process takes a few moments. To complete the effort, you will unbuckle the harness drop the layout over the large dog’s head. The contrasting loop goes on top while the velvet strap goes between the front legs. The buckles are then snapped together. You can tighten the harness as necessary. The metal buckles provide a simple design for shifting the fit without worrying about loose features. The Swiss velvet body produces a good design that fits on any large body’s body. The layout keeps the dog comfortable without chafing around the dog’s skin or rubbing against one’s hair all that much. The safe design produces a good design your dog will feel comfortable with. The last of the dog leashes to see for larger dogs that pull is this Weiss Walkie leash. The design is safe to use and keeps your dog from pulling. The firm nylon body of the leash produces a good surface that absorbs vibrations and keeps the dog from feeling too much weight at a time. The lack of pressure ensures the dog will feel comfortable and not stressed to where the dog would keep pulling. The end part has a handle that your hand can keep a grip on with ease. The grooved body of the nylon rope will not rough up your hand. The connector at the top also keeps that feature from slipping out of your hand when in use, thus creating a firm single-piece body. The rope also has a reflective body that is immediately noticeable in many spots. You can order this in one of many colors, including black and blue options that fit your dog’s style well. You’ve got to look carefully at what’s out there when finding a helpful leash that your large dog can handle. Fortunately, all five of the options for the best leash for big dogs that pull that you’ve read about are all choices that fit well for your dog’s demands. But for us, the best option to use is the ThunderLeash No-Pull Dog Leash. This model is very comfortable and works well as both a basic leash and as something that can fit around the dog’s body. The firm yet flexible body of the leash and the comforting sensation it provides keeps your dog relaxed. The feature ensures the dog will not make your walk stressful. The added connectivity makes for a nice touch as well.